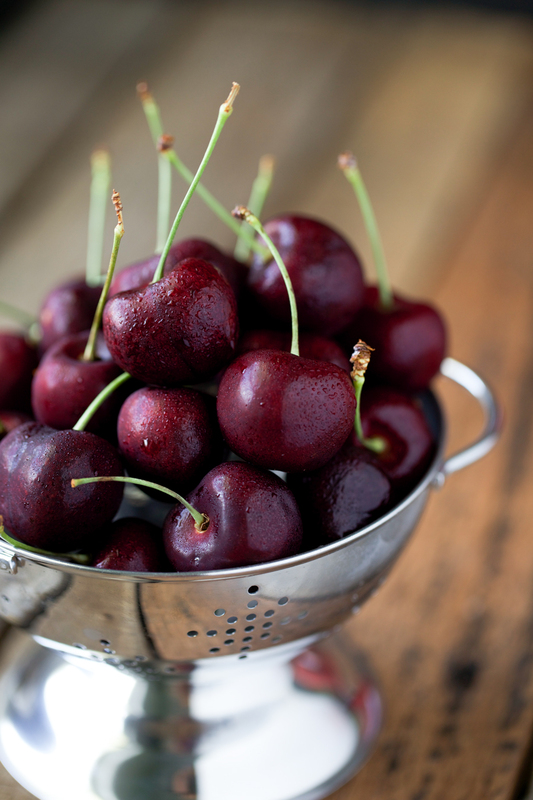 Cherry season always has a way of making summer seem just a little more special. Ruby red sour cherries and deep burgundy sweet cherries are a favorite in our house, and while the season is short, we find plenty of ways to enjoy them. If you have kids in the house it is always a fun event to watch those irresistible juicy cherries disappear when they haven’t seen a cherry since last summer. I like to snag a bowl or two to create a few seasonal recipes and cherry water kefir is usually on the list. Water kefir grains are small and translucent, gelatinous and crystal-like structures that are full of beneficial bacteria, and it’s those beneficial bacteria that help to transform sugar and fruit juice into wholesome, naturally fermented drinks, reducing their sugar content and giving them a probiotic boost. Check out this quick water kefir tutorial for the full scoop. Water kefir is a summer staple in our home, and it is fun to take some of those brewed batches of water kefir and give them a bubbly, second ferment make-over with fresh summer fruit. 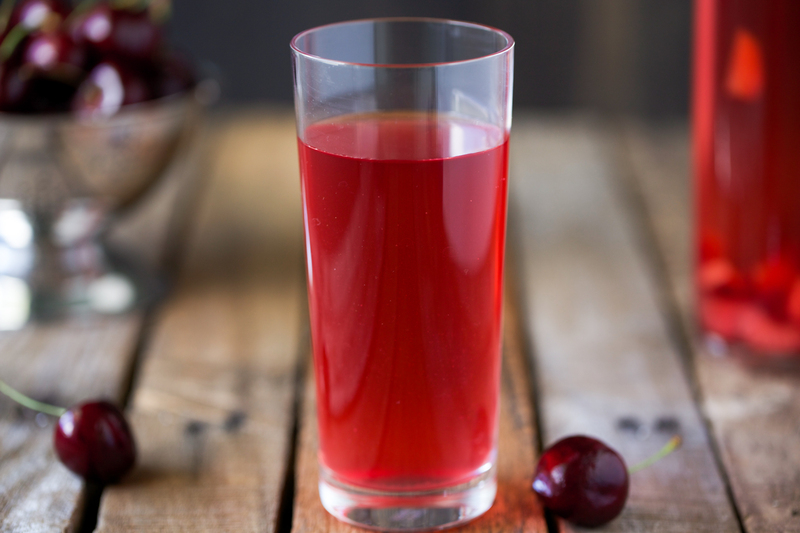 Sweet cherries turn that mildly lemon water kefir into a bubbly sweet cherry soda-like drink. Drinking probiotic-rich drinks like water kefir keep the beneficial flora in the gut balanced. The good bacteria in the gut not only aids digestion, it also boosts the immune system. The integrity of the lining in the intestines is crucial in keeping harmful pathogens at bay, and the gut flora presence is a first line of defense. For kids who have never had water kefir before, start out small and even water it down a little to ensure they tolerate the extra bacteria well. I start my toddlers out with a tea cup half full and splash a little water in.) Adults who are new to water kefir might also take care to start out slow with a couple of ounces at a time to ensure the beneficial bacteria inhabit the environment well. 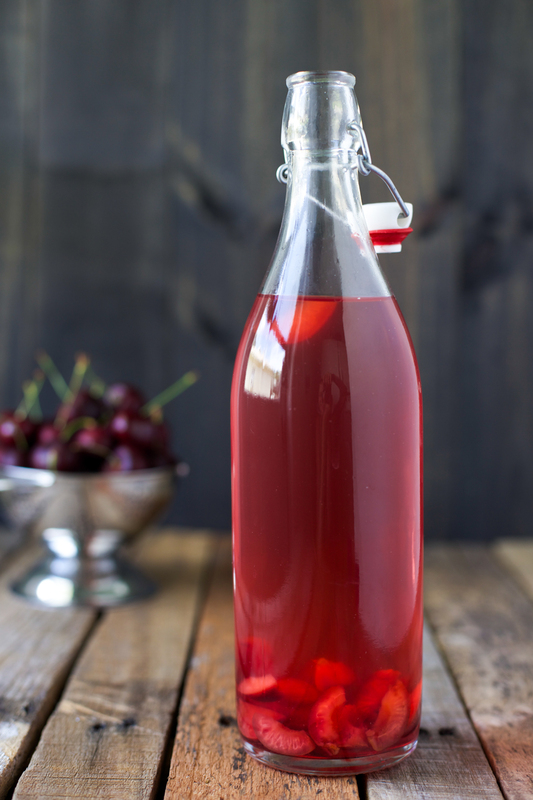 Mildly sweet, slightly tart and wonderfully bubbly, this homemade soda gets its fizz from water kefir and its vivid red color from sweet cherries for a drink that's traditionally fermented and rich in beneficial bacteria. First, brew the water kefir. Warm 1 cup of water stovetop and while that is warming up, place the sugar, sea salt, and concentrace into a half gallon jar. Pour the hot water over the sugar, salt, and concentrace and stir with a wooden spoon until fully dissolved. Fill the rest of the jar with fresh water, leaving a couple inches of headspace at the top. The water kefir grains need a room temperature environment so this cools off the hot water. Add the water kefir grains to the sugar water. and then seal your jar with an airlock (like this one). Let the water kefir ferment at room temperature, out of direct sunlight for 2-3 days, or until the flavor suits your taste. After a few days or when the water kefir tastes the way you like, prepare your cherries and place them into flip-top bottles. Strain the brewed water kefir (you can place the grains into fresh sugar water to make more kefir). Pour the brewed water kefir into the bottles with the cherries, and seal. Let the cherry water kefir ferment at room temperature for 1-2 days until bubbly. Transfer to the fridge where it will keep for 2 weeks. Strain and serve chilled over ice. In order to make water kefir and many fermented sodas, you’ll need a starter culture: water kefir grains. Water kefir grains are a culture of beneficial bacteria that takes on a clear, gelatinous, crystal-like structure, and it’s these beneficial bacteria that eat up the sugar and fruit juice, making these naturally fermented sodas wonderfully fizzy. You can order them online here. 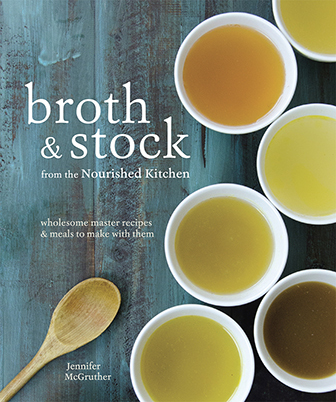 Traditionally fermented drinks are super easy to make at home, and are rich in beneficial bacteria that help to build gut health and support the immune system. Most are made using a starter culture, such as water kefir or kombucha. Cranberry Orange Water Kefir is a sweet, tart fizzy drink that’s easy to make just like this Cherry Water Kefir. Cinnamon Spice Kombucha is another fizzy, fermented drink that’s a great addition to the wintertime table. Raspberry Ginger Soda is made with a ginger bug, and combines the sweet raspberries with the fire of ginger for an easy, probiotic drink. Probiotic Naturally Fermented Honey Lemonade can get super bubbly and tastes like a mostly dry, mildly sweet lemonade soda. Concentrace helps to keep your water kefir grains healthy as they benefit from a high mineral environment. You do not need them for this recipe. What other ways can you use the concentrace? I like to have multiple uses for a new product before investing! Thank you! I use it as a mineral supplement and add it to water. I’ve got the silly question for the day…how do you get the pieces of cherry back out of the flip-top jar once you’re done?? This sounds delicious! 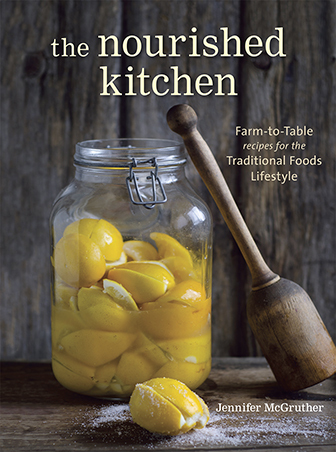 My hanging question is will this same recipe work,, with regular kefir grains -with/w/out a wee drop of it’s whey, or kambucha? I have either here at my disposal! To put it another way, shouldn’t this work with just whey as well as a ‘plain’ fermented drink? The more I think of it flora and fermenting for same doesn’t need a totally exact recipe in order to work!!! Am I not right?-not that this wouldn’t be as directed!! I’m not worried about picture quality drinkables here just if it will work with either of them for flavour, effervescence and flora! Trying to think/create outside of the box here!